A series of very unique life events have formed me. My dad, accepted me into his life as his 6th daughter when I was 2 years old. My situation put me into a cultural position to be shared between family, where I spent summers and many other spare moments in Twin Hills with my mom's family until I was old enough to commercial fish. In Twin Hills I was also accepted into my aunt's family as a daughter, growing up with cousins who were more like siblings, not to mention an extra set of parents, rather than aunt and uncle. My grandparents were also in Twin Hills, and they did their part in smothering me with affection. I'm very grateful for being raised by everyone and experiencing a childhood with a variety of very influential people who opened my mind to diversity. Through village life, I gained a very deep appreciation for subsistence, the seasons and cultural relationships, respect and non verbal communication. Through my life in Dillingham, I gained my experience with commercial fishing, diversity of culture and community dynamics and friendships. Life in each place is different, but share many common values, such as subsistence, outdoor recreation and teamwork. I was lucky enough to experience life in both worlds and credit much of my life outlook and sensitivities to finding a way to create harmony between the mixed world in larger communities and native lifestyle and values in the village. Arts and crafts were always a part of my life. There are skin sewers, grass basket sewers, beaders, carvers, and carpenters in my family, but drawing found me through my dad when I was 5. It was maintained within me through family and school support in Dillingham. Although it was a skill that was within me to make others happy and a tool to entertain humorous situations as a feisty youth, it was always a shadow among my priorities. Not until I was in college did I realize the scope of it's importance and it's potential to change my life forever. What started out as small painting commissions to get me through community college evolved into a very passionate way of making a difference in the lives of the people in my community through murals. The transformation and level of happiness that I witnessed within the faces of our community made me feel so good that I couldn't put art on the side burner any longer and it became my goal to spread happiness through visual communication. Art made me feel like I could play a positive role in the lives of others. 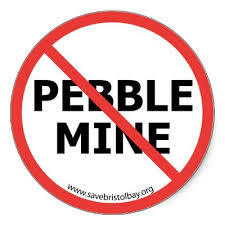 As I continued education outside of Alaska, Pebble Mine moved in on Bristol Bay. Class assignments for research projects helped me to understand what Pebble was and the risks it posed to my lifestyle back home burnt a blazing fire in my soul. There was no way I could step aside and allow the largest open pit mine in the world plow through every value that I loved without speaking out against how wrong it would be to potentially destroy a way of life I had not found anywhere else I had visited outside of Alaska. Since then, my inspiration to share what we love in Bristol Bay has been splattered on canvas after canvas as my contribution to spreading awareness, along with working as an outreach coordinator for a local non-profit whose main goal has been educating locals on mining and risks it poses to subsistence. Today, I open myself up to working with groups who prioritize protecting subsistence and sustainable resources, but have taken a step forward with committing my life to sharing what life is in Bristol Bay primarily through my work as an artist. My goal is to stand tall when my voice is needed, but to offer additional ways of communicating to the world through art. This in turn gives me more time to learn to live a subsistence lifestyle as an adult, providing for my family, like my parents and grandparents did for us. The world is as bright as we make it, but it takes some work to pull back the shades and let the light in. PAINTING: I started selling commissioned work in 2003, but since then have slowed down on commissions to focus on my vision and sell self inspired work. I work primarily with acrylic on canvas. I enjoy painting because of the quick results and instant satisfaction. My mood drives my subject matter and often switches between humor, romance and life values. It is still something that I'm experimenting with and so far subjects have been based on culture and landscape, but I'd like to push my boundaries with style and composition in the near future. I've also yet to work with professional muralists and hope to gain insight and training to improve. TEE SHIRTS: Tee shirt designing was something that started in 2006 for laughs. My first shirt design was poking fun of Dillingham with our youthful and rebellious nickname, D-Hole. Since then it has evolved to share the light hearted personality and humor of our region. Although every now and then my rebel pops out and I showcase my screw pebble design that I came up with in college. GRAPHIC DESIGN: I took graphic design at Fort Lewis College and occasionally take on commissions for logo design. It's more of a hobby since I've decided to follow my heart through painting.